We know this is a bit of a cliché – and one you may well have heard many times before – but it often comes to mind when people talk about what they do. Instead they’ll give you their job title which, often, isn’t very helpful at all. “I’m a Director” OR “I’m a Builder” OR “I’m a Doctor.” And, by prefacing it with “I am”, their job becomes their identity. If you stop and think about it for a moment, this doesn’t make any sense at all. Our job isn’t our identity. The person who we are. We’re not a Director / Builder / Doctor / fill in the blank. Rather, we’re each an individual who is paid for using their skills in a particular way to do certain tasks or help certain people. Our work is only one facet of what we do. One way in which we choose to spend our time. What about our identity at home with our families? With friends? In the local community? Or the myriad of other ways in which we choose to spend our time? By making our job – what we do – our identity, it’s not surprising that people become so competitive about it. Or have such problems when they retire and lose their identity. And this is a topic we’re going to return to in a couple of weeks’ time, as there is so much backwards thinking about retirement. And we’re not just talking about the “my job is more important / better than yours” perspective. Those on the shop floor against those in the office. This industry against that industry. There’s the cost of doing it. The number of hours worked each week. Stresses that accompany it. The commute to get there. And so the list goes on. What’s particularly sad is that this completely ignores what work is really about. It’s simply a way of providing the resources needed to live our lives. To put a roof over our heads, food on the table, clothes on our back. We know that some people may find this approach overly simplistic. But the real question is whether making your work, your identity, makes you happy? Or fulfilled? Or, just as importantly, gives you time to pursue all the other things that make life such a wonderful experience? Given this, it’s not surprising that all too often the gap is filled by the latest fashionable “must have”. And, by a strange twist of fate, this simply adds to the problems. The all too transient “high” of acquiring something new simply ties us tighter into the world of work, as there’s then an extra credit card bill – or loan – to pay at the end of the month. So here’s a radical idea. How about looking at work in a different way? Working to live, rather than living to work. And this starts with looking at the true cost – in every sense of the word, not just in money terms – of whatever it is that you’re currently being paid to do. Then there’s the cost of getting to work. The fuel in your car or ticket for the bus or train. Parking at the station or in the town centre. The lunch and other things you buy every day - or at the weekend (!) - to help your life along. And don’t forget the intangibles. The stress, tiredness, lack of fulfilment and all the other things that have become part of your “working norm.” Lack of time spent with those you love. Missing out on doing the things you enjoy doing. It’s probably the first time you’ve looked at things in this way and will probably come as rather a shock to you. It certainly has for the clients we’ve done this exercise with. The moment when they suddenly realise the true cost of their job. And, more importantly, how they could take a sizeable salary cut to do something completely different that they really enjoy doing AND still be better off in every sense of the word. 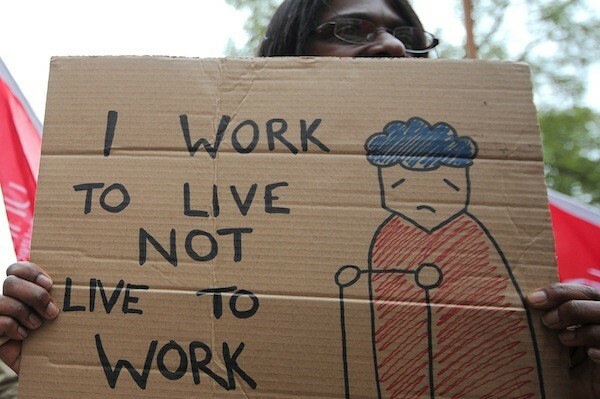 So, now you know where you’re starting from, isn’t it time to look at working to live rather than living to work? What you would really love to do AND be paid for. How you could use your own unique skills and talents in a way that you find enjoyable and fulfilling. Letting your work feel more like a hobby, something you love to do. And, if this sounds far too “pollyanna’ish” it really isn’t. Over the years, we’ve spoken to many, many people with this approach to work. Something that feels like a hobby they’re paid for and they love doing. This is certainly how we feel about what we do. And – this may surprise you – you don’t have to be self employed to do it. Many people have found this within a conventional working environment, but one they approach in a different way.